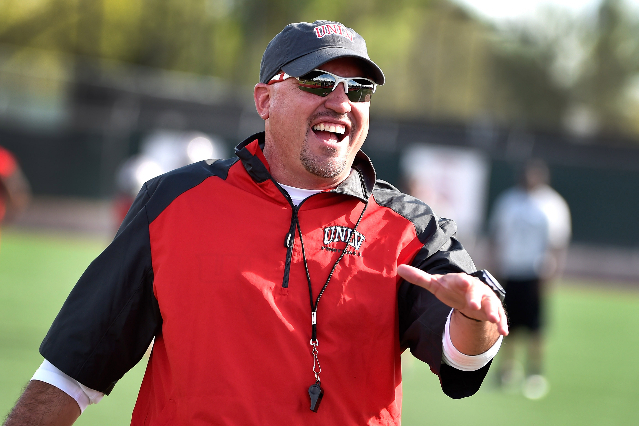 The UNLV football program has seen so many new eras that they really aren’t so new anymore. Each new era is the same as the old era, and the dismal numbers bear that out. Bobby Hauck resigned as coach last season after posting a wretched five-year record of 15-49, including four two-win seasons (2-11 last year). In fact, UNLV has recorded eight two-win seasons in the past 11 years, under three “new-era” coaches. But with coach Tony Sanchez ushering in the newest era, there finally seems to be some palpable optimism. National media have taken notice of Mr. Sanchez making the leap from Bishop Gorman High School to leading a Football Bowl Subdivision college program. That’s because Mr. Sanchez’s job isn’t merely winning games, which even the most optimistic Rebels fans recognize is going to be difficult to do for the next couple of seasons. His job is to save the program. If the Rebels slog through another four or five years of misery, the university will have no choice but to consider dumping the program. Mr. Sanchez must get this community behind UNLV football in a way that it never has been. He needs to make sure the football program not only begins to pay for itself, but eventually starts supporting other UNLV teams. As is the case at major universities nationwide, a healthy football program is essential to having a viable athletic department. The Review-Journal’s Mark Anderson reported last month that this past academic year marked the first time in years that the UNLV athletic department met its budget. Now the department — and specifically the football program — needs to take the far bigger step of shedding taxpayer support and becoming self-sustaining. Mr. Sanchez’s hiring seems to be aiding that effort. Mr. Anderson noted that, ahead of today’s season opener at Northern Illinois, nearly 4,300 season tickets had been sold — about 10 percent ahead of last year’s pace — and single-game tickets were selling at a brisk pace, as well. It’s going to take that type of support and far more to get the program to a point of respectability. But Southern Nevadans should support Mr. Sanchez, who left one of the nation’s best high school football programs to coach one of the nation’s worst college programs. He has fire, energy, high expectations and relentless optimism. Mr. Sanchez is exactly what UNLV needs, and valley residents need to give him a chance by getting behind him and who he puts on the field — by sticking with him as he builds a program from nothing. Then, and only then, will it truly mark a new era of UNLV football.